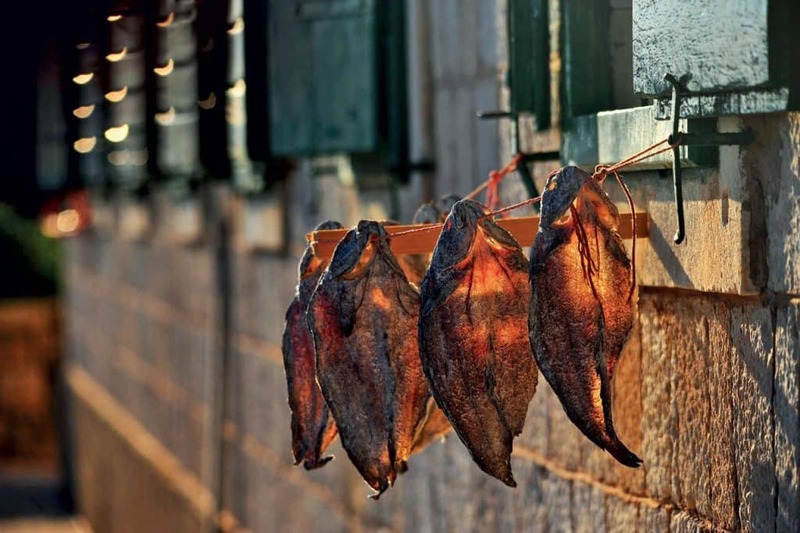 Dried and smoked fish have been served since ancient times on the tables of fishermen and farmers of the Dalmatian islands – conger, grey mullet and hake on Hvar, forkbeard on Vis, all the way to smoke-dried game-like catfish, eagle ray or ray served just before the grape harvesting season – a custom similar to those of islands Šibenik and Zadar. In the 60s, squid and octopus also underwent the process of drying and smoking in fishing huts until, as with all other homemade dried sea delicacies, these were pushed back by imported codfish. Soon followed by the use of refrigerators – it was no longer necessary to preserve the remainder of a catch for hungry days, as was the case in the past. Today smoked tuna, shrimp, shellfish, sea bass and sea bream are pricey delicacies served in restaurants, not fisherman food saved for special occasions. ‘I remember some 40 years ago when returning from a fishing trip, fishermen would slice fish open at sea and hang it on the sails to dry until reaching the port. Besides, dried fish would later smoulder over fireplaces in taverns creating an internal environment hostile to bacteria. We mostly smoked catfish, rays and angel sharks, which is of superior taste compared to other fish, but unfortunately scarce in number in the past few years’, Zlatko Krpetić shared with us, a Split artist focusing his photography and sculpture work on the traditions of his ancestors, smoking fish originating from the island of Vrgada in the Zadar archipelago. Krpetić commented how only very few fishermen dry shark meat in the attic or in a tavern with the aim to treating their taste buds for Christmas or in wintertime to a seafood delicacy when harsh weather conditions do not allow safe passage to the open sea. 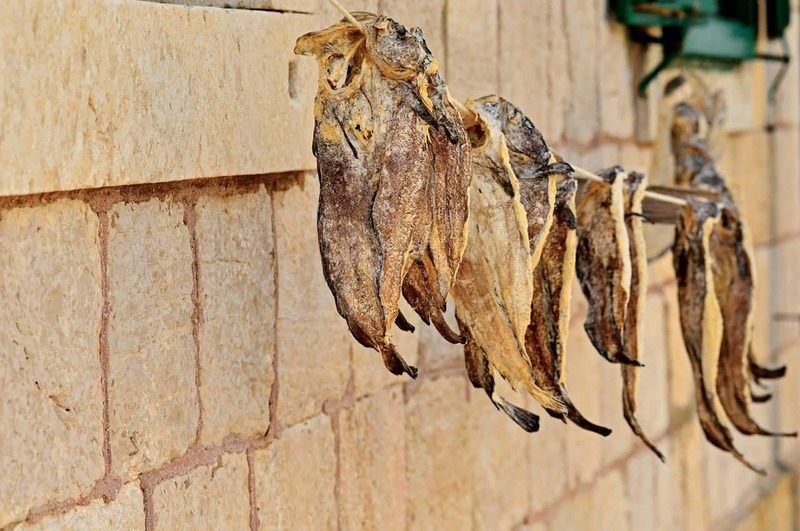 Back in the old days, having completed the air-drying process, Vrgada locals would put the fish in jute bags to be stored in taverns, extending its shelf-life for up to two years! Sooner or later, they would cook it the same way they prepared dried codfish. ‘In the past, mostly sharks of more than 30kg were dried and smoked, fishermen would hunt them all year round and it was an essential element of nourishment to the local population. Shark meat was prepared in many ways; cooked as a stew, ‘in bianco’, and fresh meat would be fried or breaded just like today, some would even eat it raw. Coated in grapevine leaves and then grilled, shark liver presents a true-gastro pearl, a delicacy from the kitchen of our ancestors’, added Krpetić whose grandfather Stipe Torić, in the 30s of the last century, was a Vrgada president of the first Fisherman’s Cooperative in Dalmatia founded in 1911. On the south side of Hvar and Pelješac people used ‘muškadur’ for drying fish, a box made of wire grid with a wooden frame, intended to defend food from insects whilst enabling the circulation of fresh air. Prior to drying, fish had to be fully cleaned – boneless, headless and gutless, then air-dried in bura (a powerful northeast wind). Conger, forkbeard, different types of sharks, octopus and sometimes even musky octopuses, would be hung in island smokehouses and left to mature in smoke for a week until their colour turned dark. On some islands like Ugljan, that process would last for months, even a year until the aroma and flavour of the fish would reach a delicious, high-class, smoky-flavour. ‘As far as I remember we were drying and smoking fish until the 60s of the last century, until the island was supplied with electricity and Sućuraj got its first refrigerator. I remember noble tables always served codfish during feasts, while our fishermen’s households would dry and smoke the catch’s surplus to prevent it from rotting. First, they would clean it, wash it in the sea, salt it well to take out moisture and then let it air-dry for a few days in the wind and shade. It would sit in an insect-free, fly-proof, pre-fridge case called a ‘muškadur’ allowing a safe preservation process. In farmer’s homes it was smoked over a fireplace in old kitchens, later prepared as codfish stew, boiled with potatoes or prepared a la fisherman – a layer of potato slices, a layer of codfish pieces placed in a pot, all covered in water. Nowadays fresh fish is rarely dried, because it is easier to buy some at the store, even winters have been too weak in the past few years, with too much humidity and without any wind, meaning unsuitable conditions that leading to spoiled fish products. But fish can always be cleaned for smoking, left to sit in brine and placed in the deep freezer’, said an 84-year-old lady originating from a heavy-fish-eating family from Sućuraj, a fishing village on the south point of Hvar. Fish has been dried and smoked ever since the ancient times and our ancestors managed to find new ways to give fish a longer shelf-life, meanwhile, creating special flavours. Let’s just say the first famous, commercial use of this type of fish preservation was seen in Poland during the 17th century. While here, scarce number of households smoke tuna, sea bass, sea bream, mussels, shrimp, the norther areas like Alaska, Canada, Greenland, Island, Scandinavia and northern Russia have been exploiting this industry and supplying the world with smoked herring, salmon and codfish.